“I want to avoid root canals” is a nearly universal concern you hear from patients. Lingering pain or occlusal tenderness after restorative dentistry or root-canal treatment persists after occlusal adjustments more often than we care to see. The next step can lead to either a happy ending or serious consequences. The first case presented below shows what can go wrong, i.e. the pain persists after extraction of two teeth. Proposal: Pulpal angina from chronic oxygen deficiency, just as in cardiac angina, is a much-overlooked contributor to persistent occlusal tenderness. Pulpal angina (PA) may be present at the time of initial treatment and still reversible in its early stages. 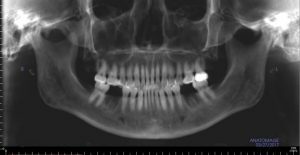 The second case presented below shows how root-canal treatment was avoided for a new patient after a new crown had been placed elsewhere by managing pulpal anger both orally and systemically. Prior to starting restorative dentistry or recommending root canal treatment, ruling out jaw clenching and teeth grinding (now called sleep bruxing) can lead to better service to the patient. Symptoms are reactions to some cause, and the pain site can be and often is apart from its source. 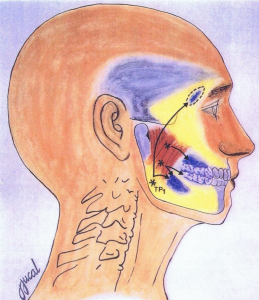 Trigger points in the masseter muscle are known to refer pain to molars. Toothache can come from dentin/pulp exposure, restorative dentistry, undiagnosed muscle trigger points, or other causes. Knowing all the non-tooth causes and treating accordingly is necessary to resolve persistent pains and nagging sensitivity. The two cases presented below highlight the issues at hand. 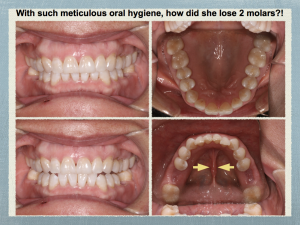 Both patients – 56-year old CB and 41-year old BK – had regular recall care and came with excellent oral hygiene. CB came to me due to pain that began after a crown had been placed for a cracked tooth #30. The pain had persisted despite root canal treatment of the tooth by an excellent endodontist. CB liked her conventional dentist, and she let him repeat the same sequence on #19. The problem: Her pain continued even after both teeth were extracted. Tooth #30 cracked while chewing 2 years ago. A new crown resulted in lots of pain. Root canal treatment on #30 by specialist resulted in 50% reduction of pain. Pain in tooth #19 began shortly after root canal treatment on #30, and pain in #19 remained unchanged after root canal treatment. Pain in both teeth remained unchanged 2 months after both were extracted. Serious risks and consequences can come from staying inside the traditional dental box, using only panoramic x-rays, and study casts to determine irreversible treatment. Two teeth were treated and lost without considering the possible causes. The dentist offered to credit CB for the money she paid for the failed dentistry and extractions. Consider the airway and its effect on the dental pulp before starting restorative or endodontic treatment. Better outcomes require different thinking. 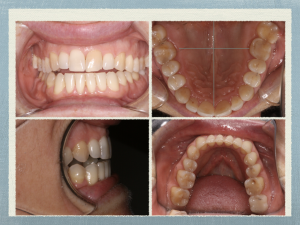 Can there be non-tooth factors undiagnosed in this case? In my opinion, CB’s toothaches likely came from “pulpal angina” and possibly a masseter muscle trigger point, neither of which were addressed by her “in-the-dental-box” treatment. Cone beam CT imaging showed a narrow airway with a high risk of collapse during sleep. Pulpal angina is the dental version of a myocardial infarction, and the pain comes from oxygen starvation. Chronic oxygen deficiency also leads to muscle trigger points that are regular features of chronic pain in TMJ dysfunction. 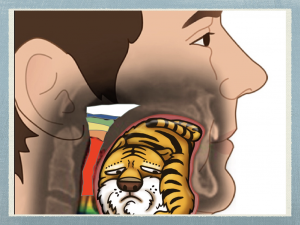 If a narrow airway is the cause of oxygen deprivation, then what is the cause of narrow airway? Let’s consider the next case. BK wanted to avoid root-canal treatment desperately on an increasingly painful tooth after a new crown (#18) had been placed by a highly respected biological dentist. Adjusting its bite did not relieve her pain. She was wearing a TMJ splint 24 hours a day when she came to see me. A new crown #18 tender to bite. Left TMJ clicks for which she was wearing a dentist-made appliance full-time. Recent neck crackling and chronic shoulder pain. “All my pains and maladies are left-sided,” BK added. This is a big red flag in the WholeHealth view that putting a crown on tooth #18 (lower left second molar) is risky. How does the dentist elicit such crucial clues from the patient? Answer: By saying and demonstrating that you are WholeHealth-oriented. 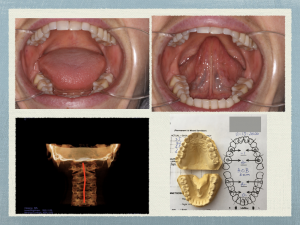 BK’s anterior open bite came from having a normal size-6 tongue inside a size-3 mouth, which drives the tongue into the oral airway and creates a wide range of medical, dental, and mental symptoms that I call Impaired Mouth Syndrome. A patient with Impaired Mouth Syndrome can have medical symptoms in a dentist’s office and dental symptoms in a physician’s office. In clinical practice, however, dentists fix teeth and doctors fix the rest, and the parts that make up the body and the mouth are hardly ever integrated into a functional Whole. 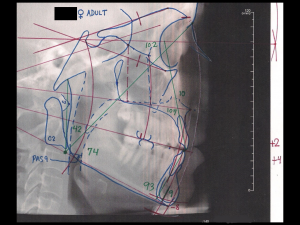 Cephalometric analysis showed that BK had an undiagnosed class III malocclusion, with retruded maxilla and entrapped mandible, which combined to give her neck and shoulder pain. CBCT imaging showed BK’s airway was 30-50% from low normal and that her cervical spinal segments were misaligned. In my WholeHealth view, BK’s pain after the new crown likely came from the side effects of her pre-existing TMD, cranio-mandibular sacral asymmetry, and injuries. So my treatment did not consist of adjusting crown #18, nor putting her on anti-inflammatories or antibiotics. Instead, I directed BK’s treatment toward the airway with an oral appliance, and I referred her for craniosacral therapy, breathing lessons, and posture training. Three months after starting her Holistic Mouth Solutions treatment, BK has not had root canal treatment. “I wanted you to know how grateful I feel,” BK wrote to me. Your understanding of how the body works from a much larger WholeHealth perspective than any previous dentist seems to have saved me. Without your appliance in my mouth, I have jaw pain. With the appliance, there's no pain. Before I came to you, it was recommended that I either break and re-align my jaw with surgery or that I might have a jaw bone infection that would also require extensive surgery. The pain went away with the appliance, showing that it wasn't an infection issue. I also feel relief and have faith that the alignment work you're doing will save me from any surgery. I'm so glad I listened to my intuition and kept searching for someone that felt right for me. I've literally been searching my whole adult life for a dentist that I feel good about. A dentist that I trust with my well-being and who I like and respect as a person. Thank you! 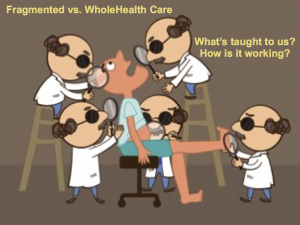 In my opinion, the mouth has a central role in whole body health, but the mouth is left off nearly all the medical and dental treatment plans today. 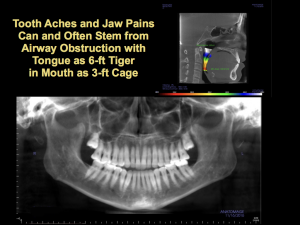 That is why I wrote my book Six-foot Tiger Three-foot Cage (6T3C): to introduce these concepts and practices that impact over 90% of patients and their dentists, doctors, and therapists. A Holistic Mouth is structurally fit to support total health through ABCDES: alignment, breathing, circulation, digestion, energy, and sleep. 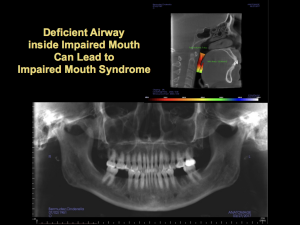 An Impaired Mouth can eat, drink, and talk, but it’s deficient, harming medical, dental, and mental health by interfering with ABCDES to result in Impaired Mouth Syndrome, which includes many common medical, dental, and mental symptoms that defy conventional and/or natural-alternative treatment. 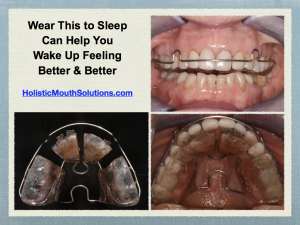 Redeveloping and aligning deficient jaws can be a natural and effective solution for resolving Impaired Mouth Syndrome. Where did the conventional and the biological dentist fall short in this two cases? Their education and training did not include Impaired Mouth Syndrome because this is a new concept I introduced in 6T3C. 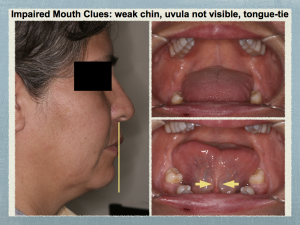 Tracing pulpal angina to its origin leads to airway obstruction inside an impaired mouth with small jaws, crowded teeth, TMJ dysfunction with aches and pains in the head, jaws, neck, and shoulders, and an intra-oral space too small for the tongue. 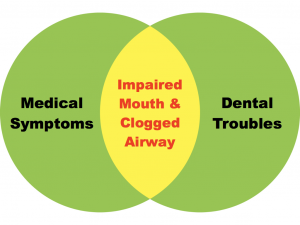 In the WholeHealth view, both CB and BK suffered from undiagnosed Impaired Mouth Syndrome with medical, dental, mental and financial consequences. Growing new eyes to see beyond teeth and gums can be helpful to avoid “pain still there” before starting crowns, root-canal treatment, and extractions. Symptom management risks symptom recurrence or aggravation. It’s time for dentists to evolve from tooth doctors to mouth doctors to prevent aggravated outcomes as shown in these two cases presented. A Holistic Mouth approach is far beyond 'drill, fill, and bill'. Good oral hygiene is essential, but no amount of brushing and flossing will fix the symptoms of Impaired Mouth Syndrome. Only a rare dentist or physician has ever heard of these concepts, very few of them know how easily your health might be improved dramatically, and fewer still have taken the training to treat you. Read 6T3C or visit HolisticMouthSolutions.com. Attend a webinar on Airway Diagnosis and Redevelopment.